Transpacific Food sources a large portion of our product from our sister company, Sandy Farms, located just east of Portland in Boring, Oregon. The rich volcanic soil, temperate climate, higher elevation and years of sustainable farming practices all factor into why these berries are some of the best in the world. Interested in U-Pick? Come on down! Sandy Farms is located along the route of the old Barlow Road, the final extension of the Oregon Trail and the first wagon road over the Cascade Mountains. The timber was cleared to establish the original farm in the late 1800’s as the Sandy area was being developed. This area, known as Sandy Ridge, held the distinction of producing the finest berries in the county and in 1942, the first 512 acres of Sandy Farms was purchased by F.T. Rowell and Robert Hudson. In 1947, the property was incorporated and given the name Sandy Farms. It is now one of the largest cane berry farms in the Pacific Northwest. In 1993, after years of carrying on the family farm tradition, the Rowell family offered their farm manager, Robert “Bob” Underwood, the option to begin purchasing Sandy Farms stock. In 2005 Doug and Bob partnered to purchase the remaining stock acquiring ownership of the farm. Over the years, Sandy Farms has grown to over 1,200 acres and received numerous awards. 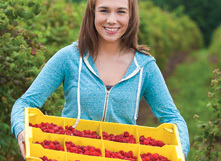 Sandy Farms has been listed as one of the top 20 berry growers in the nation consistently since 1990 by Fruit Grower Magazine.